Remove all 28 squares from the board in a neverending series of calm, randomized puzzles in a pixelated, hard-to-see resolution. Chibi Challenge is fun for all ages. Are you ready for the challenge? Feel free to leave your high scores and custom puzzles in the comments below. 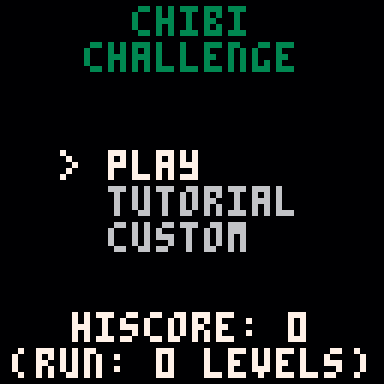 A tiny, 64x64 demake of my game Patrick's Cyberpunk Challenge for the LOWREZJAM. For the full experience, including a riveting plot in a harsh, dystopian world, please play that game. The object of the game is to move Patrick around the game board and remove all 28 squares. 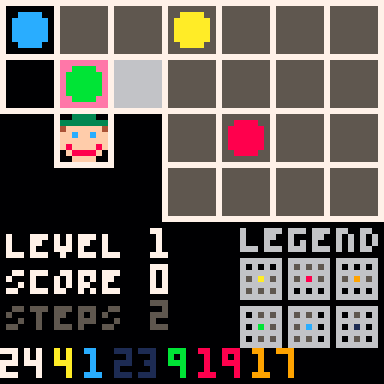 Squares with coloured balls will remove extra squares and can make the game trickier. The games are randomly generated, but you can also create your own games or input game codes made by others. The codes are compatible with Patrick's Cyberpunk Challenge.